One of the things that makes me most uncomfortable as a riding instructor is seeing students jumping or doing advanced work on a horse when they haven’t yet achieved a correct leg position. So I wanted to take some time to show you the difference in leg positions, what causes these problems, and how to fix them. This happens when you push your foot in front of your hip. It often causes the rider to be heavy with their seat, or to fall backwards into the saddle. This leads to pound on the horse’s back as they ride making it harder for the horse to jump or be properly collected and often making the horse’s back sore even with a well fitting saddle. It’s also known as chair seat because as you’ll see in the pictures above, the rider looks like they’re sitting on a chair. This happens when you allow your leg to swing back and behind your hip. It often causes the rider to fall forwards onto the horse’s neck making it harder for them to rock back onto their haunches and jump or do lead changes. It’s also the reason many people get dumped from their saddle and causes them to lose their balance. A balanced leg position is when the rider’s heel is directly under their hip. It allows them to maintain their balance and to support their weight on the horse’s back in a way that doesn’t hinder the horse’s movements. For a balanced leg you should be able to draw a straight line from the rider’s hip to their heel. General ly your leg doesn’t stay in the correct, balanced position if you’re squeezing with your knee. This isn’t the only reason why but it’s the most common. Why does it happen? Your knee is a fulcrum, or pivot point. It is designed to allow your lower leg to swing as you walk and do other physical activities. To demonstrate that I’m going to provide you with two different images. The first is with my hand dandy stick figure rider shown to the left. As you can see in this image the rider’s knee has been circled. When you squeeze with your knee you stop it;s range of motion and then allow your leg to provide a range of motion for your half and heel and foot. 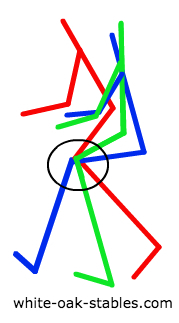 The stick figure in green shows a balanced position, the one in blue shows the foot too far forwards and the one in red is too far back. So the question is, if you can get your leg in the correct position how do you keep it there? In order to keep your leg in the correct position you must use a different part of it to stabilize your leg’s position. This is where your calves come in. When you squeeze with your calf you allow your knee a wider range of motion as well as securing your leg in the spot you want it to be. For example, let’s look back at the very first image I presented. If you look at the riders whose legs are too far forwards you can see that they are locking their knee into a position that’s similar to if you were standing and that prevents their knee from opening and closing and following the motions of the horse. If you look at the riders whose legs are too far backwards you will see their knee is bending, however it’s also tipping them forwards and off balance and putting them in a situation where they can easily topple forwards and off the front of the horse. Finally you can see the balanced riders have knee position that is slightly bent but that still allows them a solid base of balance. These riders are using their calves to keep their leg in a safe and correct position. Does your leg still give you trouble? Try out some of our lower leg exercises to help you fix it!